iPhone X Delayed Lock? Here's Why It Happens & The Real Fix! You are at:Home»iPhone»Display»iPhone X Delayed Lock? Here’s Why It Happens & The Real Fix! iPhone X Delayed Lock? Here’s Why It Happens & The Real Fix! There’s a delay when you lock your iPhone X and you’re not sure why. You probably noticed it when you pressed your iPhone’s side button, but the screen took a second or two to actually lock. I’ll explain why your iPhone lags after you tap the side button and show you how to fix the iPhone X delayed lock problem! Why Is There A Delay When I Lock My iPhone X? There’s a delay when you lock your iPhone X because it has to determine whether you’re going to double-press or triple-press the side button. Double-pressing the side button activates Apple Pay and triple-pressing the side button opens your Accessibility shortcuts. By turning off Apple Pay by double-clicking the side button and your Accessibility shortcuts, we can eliminate the iPhone X delayed lock problem. Open the Settings app and tap Wallet & Apple Pay. Then, turn off the switch next to “Double-Click Side Button”. You’ll know it’s off when the switch is positioned to the left. Open the Settings app and tap General -> Accessibility. Then, scroll all the way down to the very bottom of the screen and tap Accessibility Shortcut. 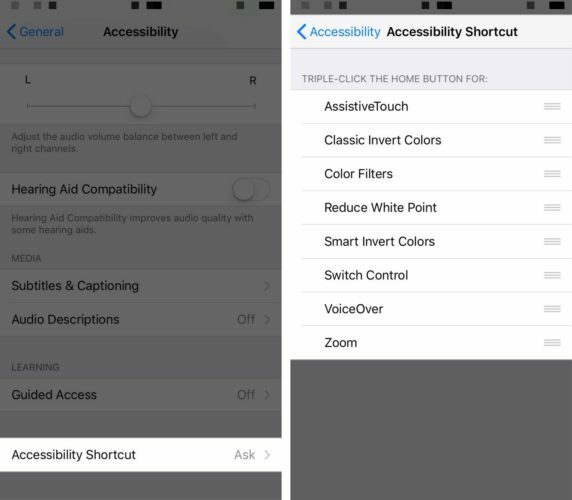 Here you’ll find a list of all the Accessibility shortcuts you can set up on your iPhone. Make sure there aren’t any checkmarks next to the items in the list! If you see a checkmark, that means the Accessibility shortcut is on. To turn it off, simply tap on the shortcut and the checkmark will disappear. Make sure to share this article on social media so you can help your family and friends fix the iPhone X delayed lock problem. If you have any other question about your iPhone X, feel free to leave a comment down below! Previous ArticleCan’t Double Click To Pay On iPhone? Here’s Why & The Fix! Next Article My Apple Watch Won’t Restart! Here’s The Real Fix.